My latest series of works, called “Divided Essence,” have developed gradually over the last eight years. By allowing the juxtaposition of geometric shapes to create a movement and rhythm of their own and placing the contrast between the textured and smooth surfaces have helped me to develop a slight disorderly effect that appeals to me. Upon first inspection you see the painting as a whole but as you stare at the work you start to see individual parts that oppose one another. A pattern underneath begins to encourage your range of vision to navigate from shape to shape and to awaken your perception of reality. To prepare the canvas for painting I either use an underpainting or leave the white canvas depending on what sort of undertones I want to shine through to the surface. Working with a heavy body acrylic paint I sketch out a rough drawing then transfer a geometric pattern over it. I then mask single sections and alternate between painting with a palette knife and a brush before finishing each segment as I go. 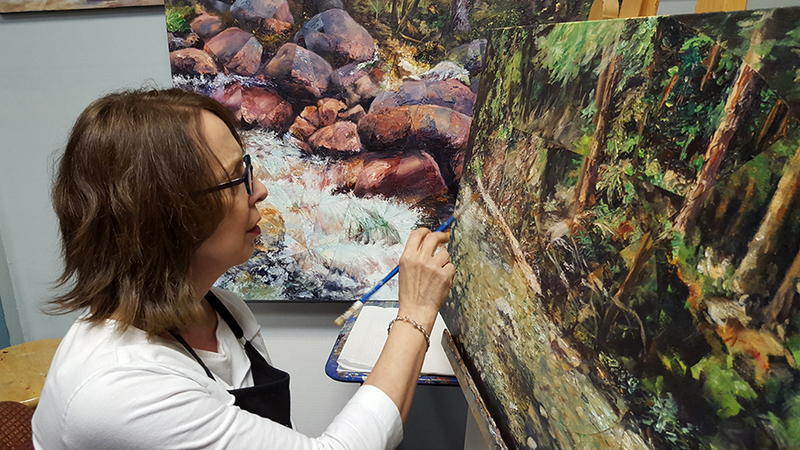 Usually the first thing people ask me about a painting is “how long did it take you to paint?” The time isn’t important to me, only the finished product, as I feel the painting is a cumulative result of years of study, training and experience. Nature scenes, particularly water and rocks, inspire me to want to recreate the setting to make it my own. I try to paint how the light hits the water, what reflections are at play, and how the shadows on the rocks give them their own personality. My references come from photos I have taken of places I have visited. Remembering what it felt like to be at the location makes it easier to have a personal and emotional connection with the art come through in the painting. I hope that when someone observes one of my paintings they will come away with a new experience that stimulates their imagination to see how the ‘divided’ parts can come together to see the art in a new ‘light’.